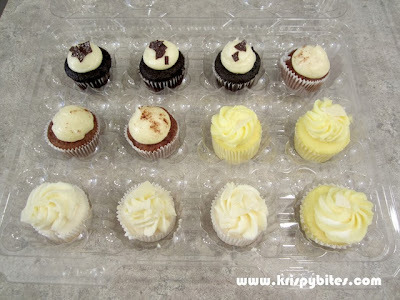 I found out about Big City Cupcakes through Groupon. 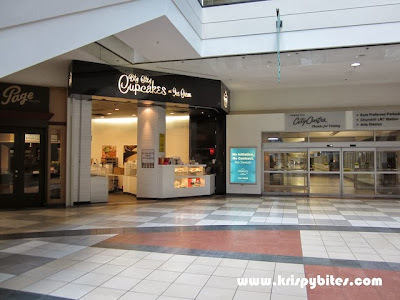 It's a small store on the Lower Level of City Centre Mall that sells cupcakes, regular cakes and ice cream. Big City's website offers convenient online ordering service for pick up in store. Just make sure you order at least 48 hours in advance. In the picture below we have the New York cheesecake, carrot, lemon chiffon and vanilla chiffon. The texture of the carrot was terrible; it was soggy, wet, and fell apart after the baking cup was removed. The vanilla chiffon was flavourless and I didn't even order this flavour to begin with; they just gave me the wrong flavour. The lemon chiffon had a strong artificial citrus taste, so the only palatable flavour was the New York cheesecake — a regular chocolate cake base topped with cream cheese and chocolate shavings. I'm usually a fan of red velvet, but I prefer Big City's banana chocolate chip cupcakes. Their red velvet is still decent, but lacks the rich cocoa flavour and dense texture that Crave's red velvet has. The banana cupcake has a slightly more substantial texture, with melted chocolate chips embedded in the batter and crunchy chocolate chips on top. I found the texture of Big City's cupcakes to be too loose and airy. 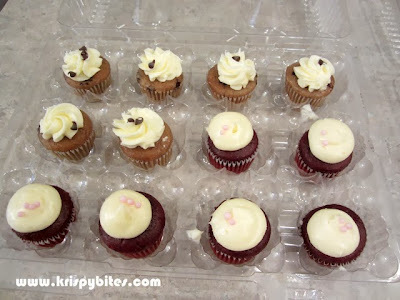 In the process of removing the baking cups, a lot of the cupcakes would not hold their shape. Also I've been to Big City 3 times and they've managed to get my order wrong 2 out of 3 times. But since I didn't open the box at the store to check, I only found out when I got home. One time they gave me vanilla chiffon instead of strawberry chiffon, and another time they gave me vanilla celebration instead of chocolate celebration. I'm starting to think that this was done on purpose to get rid of the less popular vanilla flavours. So one word of advice: always check your order before you leave! For the record, Crave Cookies and Cupcakes is still my favourite cupcake store in Edmonton.